Never doubt the depth of emotions other animals possess. Mr. G’s grief was as deep and mysterious as a human’s. His joy at reuniting with Jellybean was as beautiful and inspiring as a human’s. 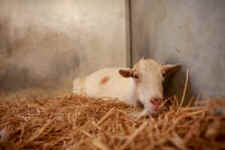 On a warm May day, a 10-yr old goat named Mr. G arrived to Animal Place’s Rescue Ranch adoption center. For a decade he lived with a burro on the property of a woman who could barely care for herself, let alone the dozens of dogs she hoarded and three barnyard animals. Animal Place was one of two sanctuaries offering to help the goat and burro when they were confiscated…but we could only take in the goat, and the other sanctuary could only take the burro. The two were separated in order to save their lives. We didn’t know the depth of their bond. Mr. G arrived stressed from his eight hour transport. Rescue Ranch staff allowed him his solitude. Mr. G refused to eat. He spent his days lying in a corner of his stall, barely lifting his head. Staff tried every treat – molasses, sweet grain, apples, wetting down food…nothing worked. Staff physically moved Mr. G to ensure he didn’t spend too long lying down. After health exams revealed nothing physically, it became evident Mr. G was in mourning, assuming his friend Jellybean had disappeared forever. He was inconsolable. After four days of starving himself, drastic actions were taken to help Mr. G.
It was time for Jellybean to come home. It would take an additional three days but soon Mr. G and Jellybean were reunited. When Jellybean entered Mr. G’s stall, he could not believe his eyes. In fact, he did a double-take! It was only when he smelled Jellybean’s unique scent that Mr. G realized the truth – his dearest friend had returned! Mr. G erupted from his prone position, snorting and inhaling Jellybean’s presence. He rushed after her into their outdoor pasture. The magical moment came when Mr. G began eating from Jellybean’s bowl! 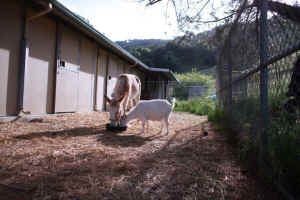 Want to know how you can help animals like Jellybean and Mr. G? Share the video! Mr. G and Jellybean have a powerful story to tell. Help them out by sharing their video showing that other animals experience a wide range of emotions similar to humans, dogs, and cats.